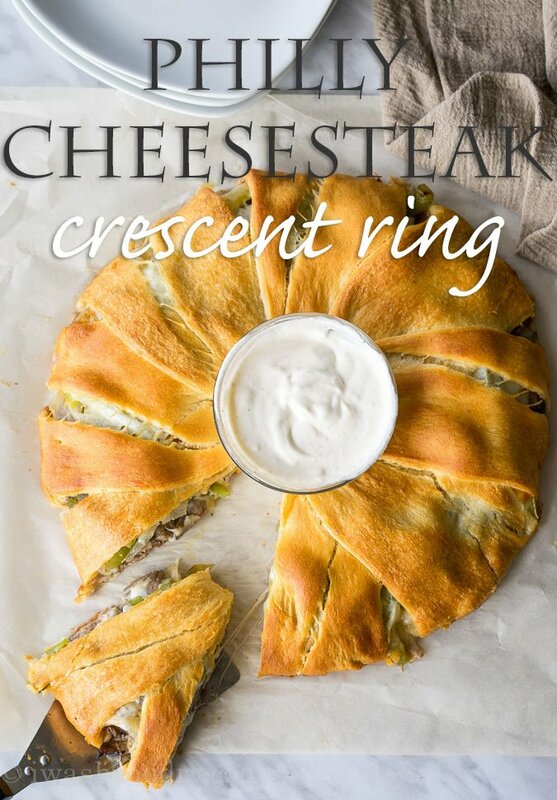 Sometimes you just want to stuff a Philly Cheesesteak Crescent Ring in yo face. It’s been too long since I’ve shared some savory recipes, so I thought why not share this delicious sandwich creation that I’ve been dreaming of for months? Let’s do this! 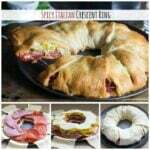 I took inspiration from my Spicy Italian Crescent Ring, which is… oh my, so good! 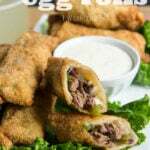 Then I grabbed the convenience of the filling in my Philly Cheesesteak Egg Rolls and combined the two for one knock out party sandwich! It’s actually quite simple to throw together, and of course I paired it with a cool and creamy horseradish dipping sauce. Because, seriously, it’s just necessary. 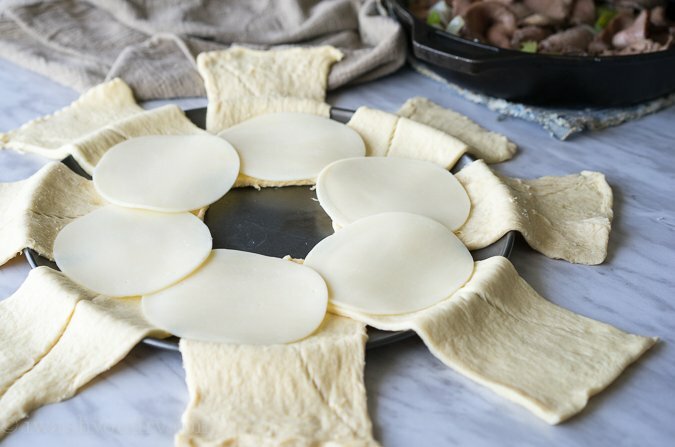 First you’ll want to lay your crescent roll dough out in a star pattern around either a pizza pan or a parchment lined baking sheet. 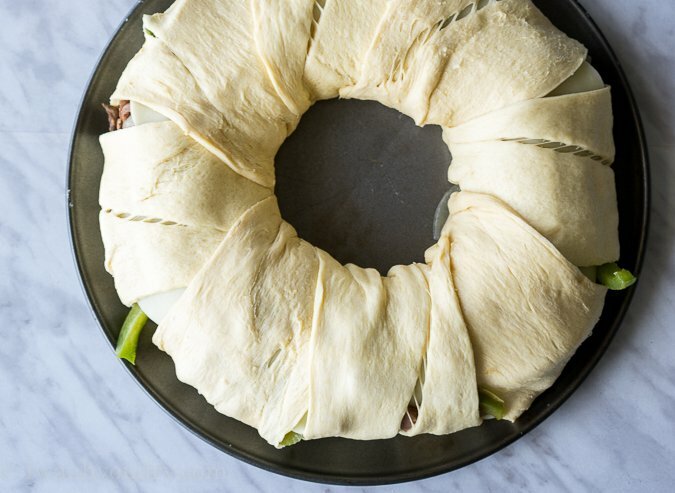 Leave some room in the center so you can tuck the extra crescent dough underneath. 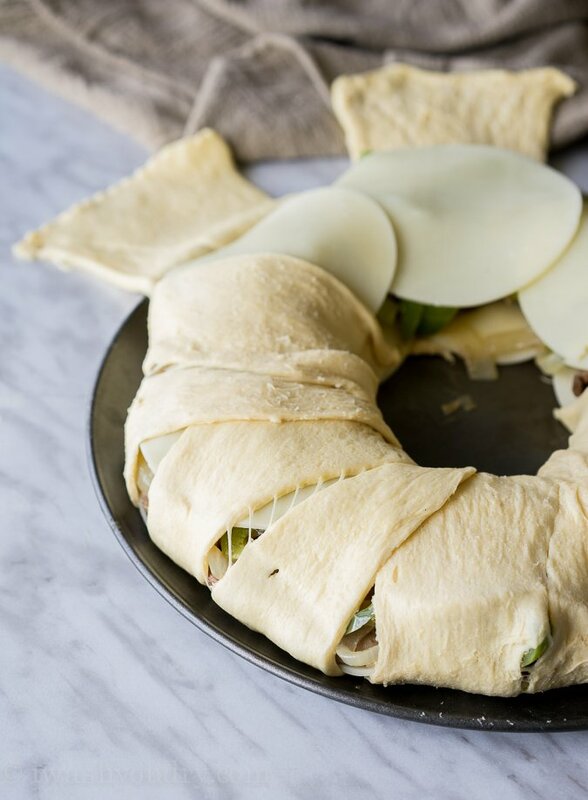 Top the crescent dough with a thick layer of provolone cheese. There are a couple options for the steak. First, you can use leftover steak strips, precooked steak strips from the store (which is what I did here), or you could simply cook up your own fresh steak and cut it into small strips. I love the simplicity of buying it already ready to go. I found the steak strips near the precooked sausages and other precooked refrigerated meats section at my grocery store. Throw on some sautéed peppers and onions, but make sure they are adequately drained. Any excess moisture will make for a soggy outer edge. 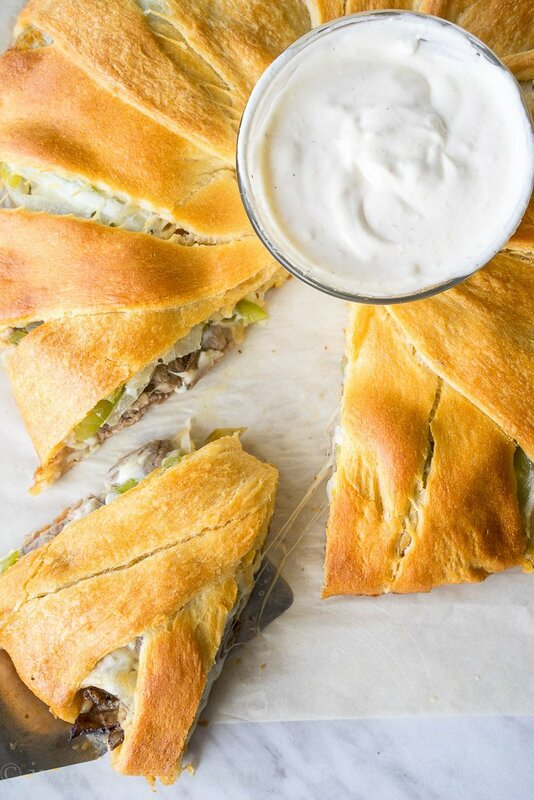 Top with another layer of provolone cheese… it’s a CHEESEsteak after all! 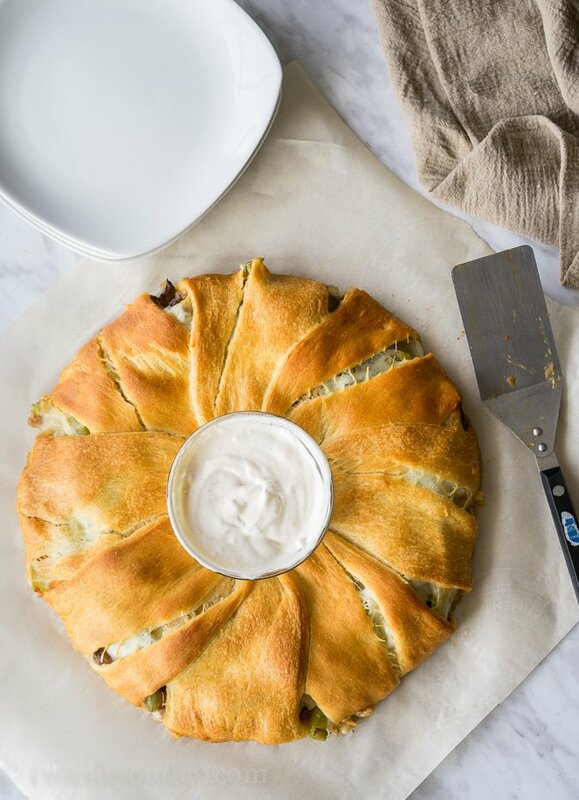 Carefully fold the crescent dough up and over the filling, tucking it under the center to secure it. 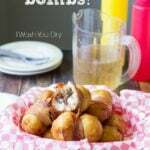 All you need to do now is pop it in the oven until it’s golden brown and whip up the super simple horseradish dipping sauce! I totally loved this sandwich. I had to call over some family members to come take it off my hands because I could just see myself eating the whole thing. HA! 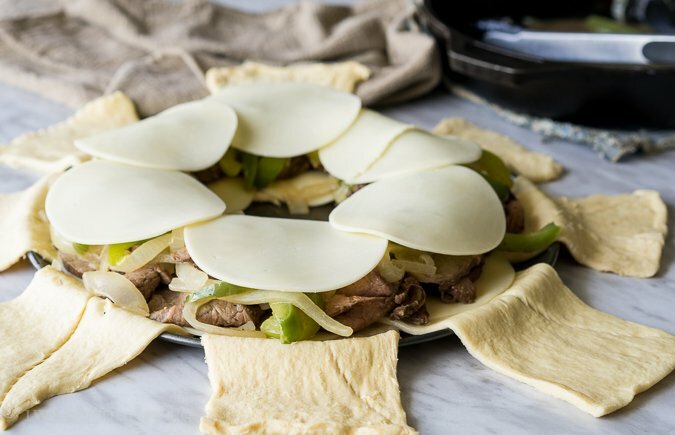 The cheese surrounds the steak, onions and peppers just like a typical cheesesteak sandwich would. 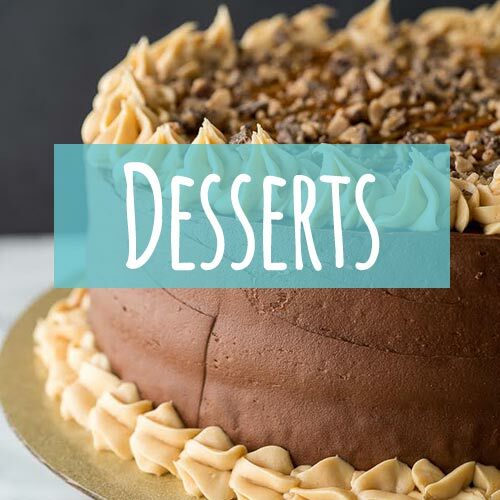 The flavors are simple yet mouthwateringly delicious and beautiful. 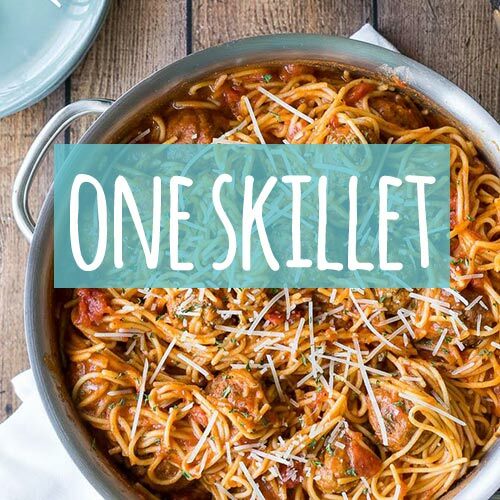 It’s sure to be a hit at your next party, game day, or Wednesday dinner. Don’t forget to make the dip! It seriously makes this sandwich ring complete! 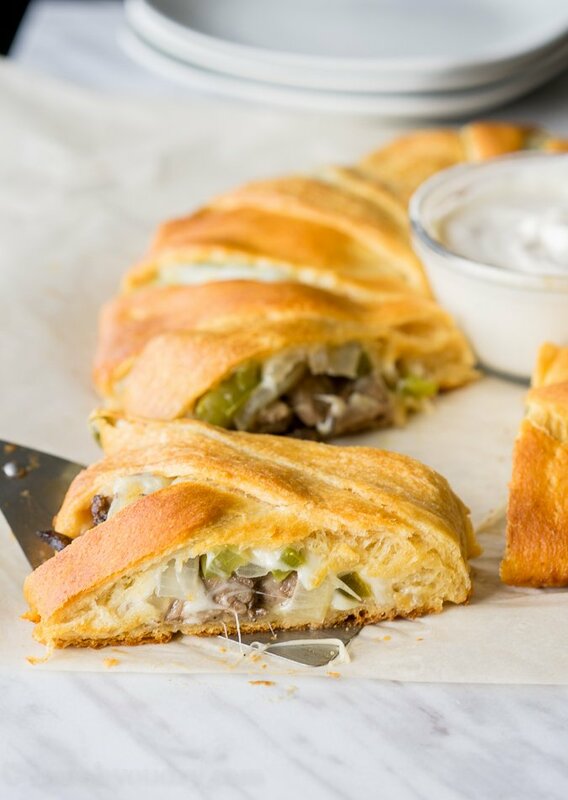 Philly Cheesesteak Crescent Ring is a savory recipe that keeps you coming back for more! Melt the butter in a large skillet over medium high heat. Sauté the onions and peppers in the melted butter until soft, about 5 to 7 minutes. Stir in the steak strips to mingle with the onions and peppers then remove from heat, drain any excess liquid. Unwrap the crescent rolls and separate into 8 small rectangles. 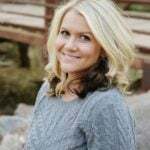 Arrange on a non-greased 12 inch pizza pan or a parchment lined baking sheet in the shape of a sun, leaving a small circle (about 2 1/2 inches wide) in the center. Half of each crescent dough rectangle should hang over the edge of the pizza pan. Place 6 slices of provolone cheese around the half of the crescent dough rectangle that is on the pizza pan. 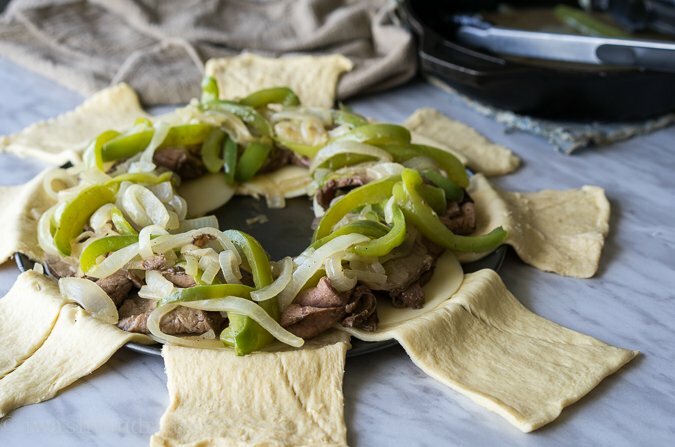 Top with the well drained steak, onions and peppers, making sure to keep the filling in a circular tube around the crescent dough. Top with the remaining cheese. 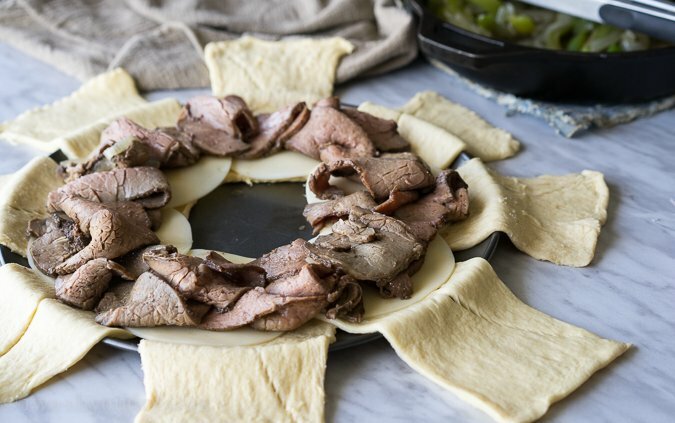 Carefully pick up the overhanging crescent dough and enclose the filling, tucking the dough underneath in the center of the ring, so all the filling is enclosed. (some might peek out, and that’s ok). Bake for 20 to 23 minutes until dough is cooked through and is a deep golden brown. Let cool slightly before slicing. Meanwhile combine the ingredients for the sauce and whisk together. 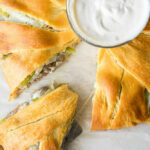 Serve the sauce with the cheesesteak sandwiches. Enjoy! *this is a great way to use up leftover steak. If you do not have leftover steak, you can grill 1 lb of fresh ribeye steaks and then slice into thin strips when cooked. This will be a perfect way to use up; the too rare (raw, really, sheesh, Walmart, did you even put it in the oven??) deli roast beef my husband got. This will make a nice and quick supper with a big salad and some baked fries. I used deli roast beef. It was good. this was so good! my husband is not a fan of any vegetables so we did half with peppers and half without & for steak there was a sale on ‘steak ums’ in the freezer section and it worked out so well. he was such a fun. i think he loved rolling the ring more than anything! thanks for a great recipe!